While Coble does possess an industry Registered Health Underwriter designation, in good standing, it is not, and has never been, a degree, and has never been awarded by Northeastern. In 1992 the designation was awarded by the National Association of Health Underwriters (NAHU) upon successful completion of three courses and three exams. The education component was administered for NAHU by Northeastern University. According to a NAHU representative the RHU designation was owned by NAHU until 1995 when it transferred ownership of the designation and administration of the education program, including records, to The American College (also known as The American College of Financial Services). An edition of “The Guide to National Professional Certification Programs” from the period states that there were no education or experience prerequisites at the time and the program consisted of three self-study courses and three exams consisting of 100 multiple choice questions. A verification website shows that Paul Coble’s RHU designation is current. Recertification is required every two years with 30 hours of continuing education credits. It is not known which courses Coble originally took to receive the RHU designation from NAHU and the subsequent transfer of credits by The American College. According to “The Guide to National Professional Certification Programs” from the period the three courses would likely have been: “Disability Income, Health Insurance, and Advanced Applications of Disability and Health Insurance”. At the time recertification was required every three years. With changes in the health insurance marketplace the RHU designation is being phased out and no new enrollments are being accepted. Current enrollees have until June 30th, 2015 to complete the program. After that date the RHU designation may be used as long as it is continuously maintained by the designee. A Raleigh New & Observer article dated October 10, 2010 listed “registered healthunderwriter (sic) certificate, Northeastern University” among Coble’s qualifications. Reference to a Northeastern “degree” first appeared on Paul Coble’s Wikipedia entry on October 18, 2011 thus: “Paul earned a RHU degree from Northeastern University in 1992”. Later the same day it was revised to read: “Paul earned a Registered Health Underwriter degree from Northeastern University in 1992“. Both entries were attributed to a user named “Dspuller” who has made edits to other NC political entries and is currently blocked by Wikipedia. 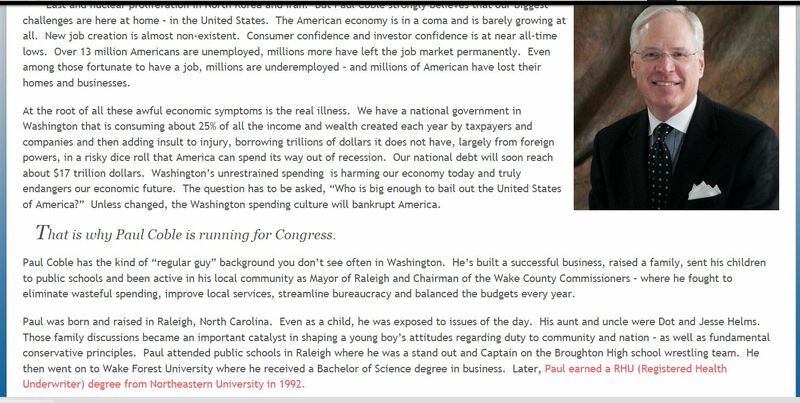 A copy of the official Paul Coble for Congress website, archived on November 22, 2011, stated: “Paul earned a RHU (Registered Health Underwriter) degree from Northeastern University in 1992.” A Raleigh News & Observer article from April 30, 2012 lists “Registered Health Underwriter degree from Northeastern University” among Coble’s qualifications that appear to be responses to a questionnaire. Coble’s LinkedIn profile lists “Northeastern University, Registered Health Underwriter, 1988 – 1992” among his qualifications. Coble’s profile on the official Wake County Commissioner’s website states: “Earned RHU (Registered Health Underwriter) from Northeastern University in 1992”. 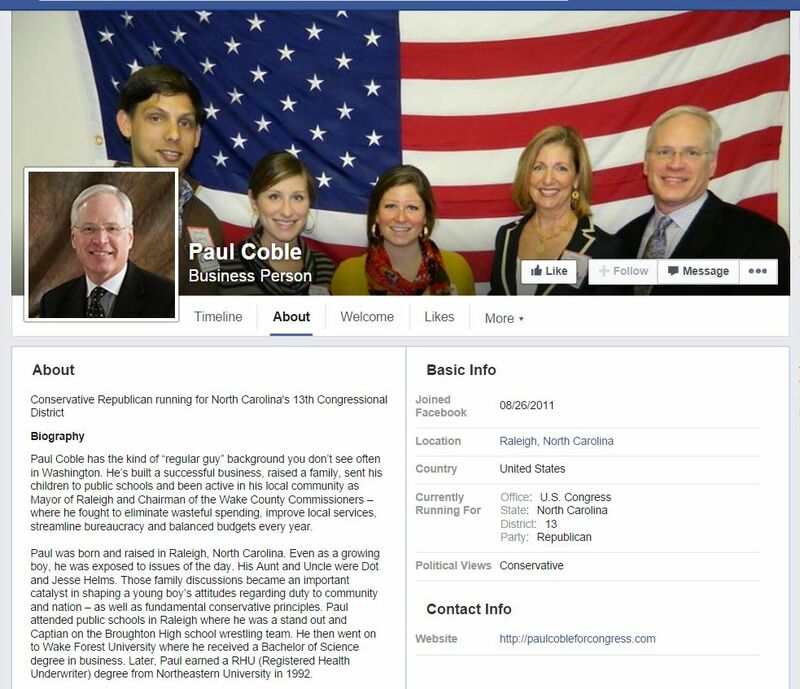 Paul Coble’s Facebook Page (joined 8/26/2011) currently states under Biography: “Paul earned a RHU (Registered Health Underwriter) degree from Northeastern University in 1992.” On February 1, 2014 Coble’s Wikipedia entry was revised by an editor to read “In 1992, he completed a Registered Health Underwriter degree at Northeastern University” with an editorial notation “cleaning up after copyvios introduced by Dspuller”. On September 24, 2014, a post on Paul Coble’s Facebook page announced: “Be sure to check out my newly launch (sic) website. Www.paulcobleforwakecounty.com Share with your friends!” The new site currently includes the statement: “earned a RHU (Registered Health Underwriter) degree from Northeastern University in 1992”. It’s typical in a situation like this to blame the error on inexperienced or sloppy intern, who is promptly sacrificed on a public altar, but three years have gone by while the error has been repeated. If there ever were such an intern they would likely have graduated by now, with a real degree. Coble’s lax oversight has allowed the misinformation to be propagated to his advantage and shows a cynical disrespect for those with verifiable educational qualifications. This entry was posted in Uncategorized and tagged John Burns, NAHU, Northeastern University, Paul Coble, RHU, The American College, Wake County, Wake County Commission, Wake District 7. Bookmark the permalink.